Last year's Fourth of July fireworks show over Magic Island is seen here from Kapiolani Boulevard. Fireworks spectators at Ala Moana Beach Park can expect a larger crowd than normal on Independence Day this year. Police are expecting up to 50,000 people at the park tomorrow and are asking all spectators to follow regulations and law. "Being that it is the weekend, you can expect more people," said police Sgt. Deric Valoroso. "Because of the crowd, it's too busy an area to be setting off fireworks." With Fourth of July coming up, the biggest show anticipated is the show at Ala Moana--Ben Gutierrez shows just how much work goes into planning a fireworks show. About 80 percent of fireworks-related injuries since 2005 happened to people ages 18 and under, according to the state Department of Health's injury prevention program. "We're always trying to stress that if kids are going to play with fireworks, they should be supervised as much as possible," said Dan Galanis, a state epidemiologist. "It'll probably go a long way in preventing burns." Police will have up to 60 officers at the park who will be on foot, bicycles and all-terrain vehicles. Some might be in plain clothes as well, Valoroso said. Valoroso said the park entrances will be closed at 10 tonight and will reopen at 4 tomorrow morning. Residents are allowed to camp at the park but are not allowed to park their vehicles inside until the entrances reopen. "That's when the madness will begin," Valoroso said. 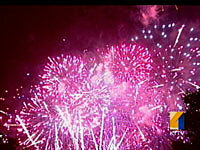 Residents are required to buy firework permits before being able to set them off on their private property. So far, permit sales are down. As of Tuesday, 74 were sold, as opposed to 89 in the same time frame last year, said Eric Kimura, administrator for the satellite city halls. The entrance channels for Ala Wai Small Boat Harbor and Maunalua Bay near Hawaii Kai will be closed about 30 minutes before the public fireworks displays there will launch. All vessels must stay 300 yards away from any location where fireworks will be set off, according to the state Department of Land and Natural Resources. "We anticipate high boat traffic in the waters off Waikiki and Hawaii Kai in the hours preceding and following the fireworks displays," said DLNR Director Laura Thielen. "We ask that users of the entrance channels observe the closure for their own safety and for the protection of the event coordinators." This year's show at the park will last for 19 minutes and 38 seconds, said Pyro Spectaculars licensed technician Sherry Souza. She also asks residents to know the law and watch after children. "Be safe with fireworks," Souza said. "My concern is for the kids. I just want to make sure everyone has a good Fourth of July." » Aloha Tower Marketplace: 9 p.m.
» Maunalua Bay, Hawaii Kai: 8 p.m.
» Kailua Beach Park: 8 p.m.
» Kapolei near Hawaiian Adventures Water Park: 8 p.m.
» Maili Beach Park: 8 p.m.
» Hickam Air Force Base: 8:30 p.m.
» Magic Island: 8:30 p.m.
» Pearl Harbor: 8:45 p.m.
» Schofield Barracks: 9 p.m.
» Turtle Bay Resort: 9 p.m.
» Kaneohe Marine Corps Base: 9:30 p.m. According to the state Department of Health, 97 people have been treated for fireworks-related injuries and burns in the past three years. » Throw any ignited fireworks from a moving vehicle. 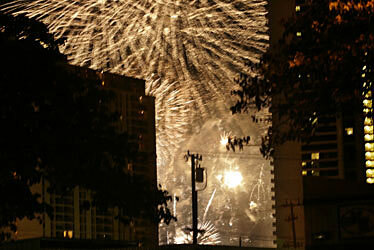 » Set off fireworks near schools, places of worship, health-care facilities and facilities for animals. » Set off fireworks on public ways and in parks and cane fields. » Set off, ignite, discharge or otherwise cause to explode any fireworks within 500 feet of a hotel. » Offer for sale, sell or give any fireworks to minors, and for any minor to possess, purchase, set off, ignite or otherwise cause to explode any fireworks, except when parents or guardians may allow the minor to use fireworks under the immediate supervision and control of an adult. » Always read and follow all warnings and instructions listed by the manufacturer for the safe use and handling of fireworks. » Use only approved fireworks from a licensed retail outlet that posts their retail permit at their sales site. » Ensure that other people are out of range before lighting fireworks. » Fireworks should be lit on a smooth, flat surface away from homes, dry leaves and flammable materials. » Never set off fireworks in metal or glass containers. » A garden hose or a bucket of water should be readily available in the event of a fire. » Young children and fireworks do not mix. Never give fireworks, even sparklers, to young children. Sparklers burn at temperatures of 2,000 degrees Fahrenheit. » Older children should use fireworks only under the direct supervision of an adult. » Carefully set up and use fireworks in an area clear of overhead power lines. Do not string fireworks on utility poles. » If using a ladder, pole or tie lines to set up fireworks, keep a 10-foot clearance from power lines.